Will future iPhone adopt standout features of post-iPhone smartphones? I was in a discussion in another forum about the next iPhone, and I feel it will probably be released sometime over the summer (June-Aug). There are probably several threads on future iPhone features, but this debate between a friend and I started in direct comparisons of the iPhone to the LG Voyager. After using a friends LG Voyager recently, and reading an article on Cnet (http://reviews.cnet.com/4370-11399_7-332-101.html) comparing the Voyager to the iPhone I started wondering what Apple might adopt from the Voyager, or other post-iPhone smartphones, to improve the next iPhone. The Voyager won overall in the Cnet article because of the few things I hope Apple adopts: a full Qwerty keyboard, 3g, and GPS (the Voyager also won because of better call quality, but I have to assume that will be better in the next iPhone no matter what). Do you think Apple will adopt what others do well into their phone, or follow their path without concern? 1) Improvements to size, battery, memory, camera, etc: While I don't need a better camera, it would be welcome. The one thing all of us expect is a larger storage, probably around 32gb would be perfect. Also better battery life and hopefully more resource ability such as more RAM and a better CPU like the Intel Atom. The one thing I read about the SDK that I didn't like was that you won't be able to have multiple programs open at the same time, only one at a time. I hope the next iPhone has enough resources to run the normal Apple programs that are always open, as well as at least one or two outside apps such as AIM and/or a GPS client all at the same time. Having to sign off AIM to make or accept calls would be annoying. Also, having to re-plot GPS directions every time you want to make or receive a call would be annoying. 2) 3g: Most of us want this, and if I can't opt out of the monthly data plan, I want it to be fast. I would have an iPhone already if I could opt out of the data plan. I won't use it, and I don't really need it with WiFi almost everywhere now, but if I am forced to pay, it better be fast when I do want to use it. 3) Real-time GPS w/ Google Maps: While I respect that many of you don't need this, there are a lot of us who want this feature. Most new smart phones are including this feature, so I can't see apple overlooking it. Why have two devices if we can have one? Imagine being in your car trying to figure out a new restaurant to go for dinner. On your iPhone, look up local restaurants in the area, pick one, type the address into Google maps, and select, "driving directions from current location." I think it would be great. Also, I visit NYC a lot, and I would use the GPS while walking around the city to find places (and do my best not to get it stolen, heh). 4) Slide-up Keyboard: While I think this is very unlikely, I would welcome it. I don't think apple should scratch multi-touch by any means, I'd want the iPhone to operate the same way it does not if the user chose not to use the keyboard, but I think everyone would use it for texting and email if it was there. That is the one thing I do like about Voyager, the keyboard, however the front screen is not used when then keyboard is out, it has a second screen, which seems wasteful. I think if you slide up the iPhone screen a keyboard should be shown similar to the Samsung F700 (http://techdigest.tv/samsung-f700.jpg), and the same front screen just changes it's view horizontally. Like I said, unlikely, but one of the few things (along with GPS) that the Voyager has that the iPhone needs. When you eliminate the second screen on the LG Voyager, you get a slimmer phone like the F700. I feel if Apple really wanted to they could get a keyboard on there with a minimal increase in depth, which I think almost everyone would welcome for a full Qwerty keyboard. As much as I want it I have to be realistic. Any one have any opinions on these features, or other things I missed? It's a given that any future iphone or ipod --- won't come with a removeable battery. Therefore future iphones will never approach the battery life of post-iphone smartphones (which are going to be thicker with a removeable battery). With respect to GPS --- you will never get "live" driving directions for free. If Apple is going to put it in the phone, then you should expect to pay for it. Why would apple want to invest in a proper keyboard. Haven't you ever tried an iPhone. I'm osting from one right now and its allot easier than typing on the little tiny things you jet with normal smartphones. Within 6 days I was typing the fastest I had ever typed on a mobiles keyboard. They have designed it well with it predicting what youean if you hit the wron keys. It's rather ironic therefore that your post is littered with mistakes. And I've typed this reply at great speed on an N95 using a real keypad and T9, without making any mistakes . I could be wrong, but I don't believe any of the current stand alone GPS units from Garmin or the other makers have monthly fee's. I know you can buy a GPS/Map software from Microsoft for use with a laptop that is live with no monthly fee, so why would Apple charge a monthly fee? I'm not saying they wouldn't, but other services don't. I don't think we'd get live traffic updates or even voice directions, for example "turn left in 20 feet" just the dot on the map moving as the GPS moves. I don't have an iPhone, but several friends do and I use it a couple times a week while we are out for the Internet. While I would take a Apple touch screen over typing on a Blackberry because the keys are so small, after using the Voyager keyboard, I went faster with no errors. 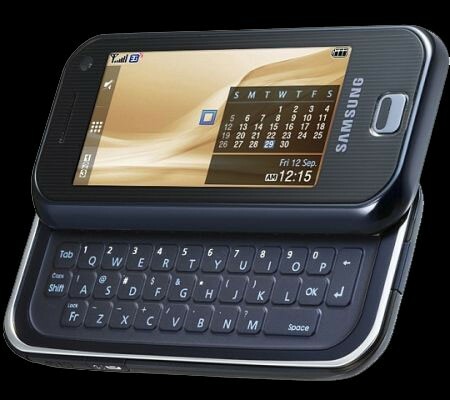 I never used a Samsung F700, but I have a feeling that keyboard is similar to the Voyagers. I don't care how great the multi-touch is, there will always be a large number of people who want a tactile keyboard. ... I don't care how great the multi-touch is, there will always be a large number of people who want a tactile keyboard. The iPhone is from Apple, not Microsoft. Apple has long operated on the principle that it manufactures the best product and leaves it to the buyer to accept it or not. To those smartphone users who prefer hardware keyboards, there are several options from other manufacturers. To answer your original question.....yes. Yes the new iphone will be better than any of the post-iphone smartphone products/prototypes. That is for dang sure betcha bottomdolla. And no, no it will not have a keyboard. Any future iterations of iphone will definatley need to include the basic specs iphone was missing. Things like SMS delivery reports. Then again that can maybe be added to the current one anwyay. Well all I know is anything that was missing software-wise will be addressed in june from the sdk and the resulting flood of software. Hardware stuff is of course a different story. I am not talking about stand-alone GPS units --- I am talking about mobile phones with live driving directions. It's like the Nokia N95. You can get the maps for free. You can use the GPS function for free. But if you want "live" turn by turn voice navigation --- you have to pay $10 a month. Im going to take a wild guess and say SMS delivery reports is software based so hopefully it will be added in due course. Man, you're optimistic. I think you're off by at least an order of magnitude. Maybe 2! It's more like 0.15%. Maybe even 0.015%. I'd have to say that the majority of the people out there would see half of your wish list as negative features. That is things they rather not see on iPhone. Right a the top of the list is a separate keyboard. Before they do that they had better release a larger iPhone. As to 3G everybody knows it is coming so what is the big deal whining about that? The only question in my mind is does this mean a new platform and the old iPhone stays around as a cheaper version in the family. In any event I don't think Apple gives two hoots about what LG does with its phones. They have their own vision and will stick with it. I was in a discussion in another forum about the next iPhone, and I feel it will probably be released sometime over the summer (June-Aug). There are probably several threads on future iPhone features, but this debate between a friend and I started in direct comparisons of the iPhone to the LG Voyager. ... Do you think Apple will adopt what others do well into their phone, or follow their path without concern? Well, your question is strange to say the least. It implies that somewhere someone believes that the iPhone featureset won't change. Obviously, that's wrong as this is the tech industry where obselescence is a way of life. It is certain that Apple will implement only some features while neglecting others, much to the consternation of a great deal of people. This is where I wish I had a time machine so that I can go back in time to prevent myself from reading that CNET article. It's laughably bad. It's done merely for cheap entertainment and the authors/editors know it as I'm sure no one is that idiotic. As should be in all comparisons, winners and losers all boil down to the features that one values the most. There are plenty of things in the Voyager that people will like/hate and vice versa for the iPhone. None of that was expounded upon in the stupid article. Not only that, I'm not sure the reviewers used the units for more than an hour or two. Improvements to size as in bigger, smaller? Thicker, thinner? Apple will target the same battery performance for iPhone G2 as there is in G1. 5 to 7 hours talk time, 10+ hours of music, 5-7 hours of video/browsing. They'll barely manage 7 hours on a 3G radio even with the new power-conserving 3G chipset they are expected to use, on the same 1400 mA-hr battery. Note the Voyager had less than 4 hours talk time while Apple has 7. I'm pretty sure they won't try to adopt that feature in a HSPA iPhone. As demonstrated with the 16 GB iPhone release, Apple will increase the storage capacity of the iPhone as flash memory storage increases. Flash densities double every 18 to 24 months. They can put in more by adding more volume to accommodate more flash chips, but that is doubtful. And it's obvious they don't like SD slots for a few reasons (not user friendly, planned obselescence). Camera improvements will be minimal as the iPhone isn't a camera phone. I'd put auto-focus, image stabilization, video recording, flash, and 3.2 MP at 50% at best. I'd be extremely surprised with 5 MP. I'm sure they'll want to do something they are proud of and unique. MMS (puny picture and video sizes) isn't something they'd be proud of. So, I think they are shooting for something like 480p H.264 video recording, but no MMS. MMS capability will be continued to be ignored - a strategic decision as they probably think it will become obsolete with ubiquitus HTML push email. SMS the same way when every phone has push email capability. For camera, I think they will try for lower MP but better performance (less noise) as well. All this would be low on the priority totem pole though. If there is GPS, I don't think you'll notice the difference that the application quit when you switched to another app and switched back. Also, the phone app works in background, so it's probably possible for one to be on the phone while operating another app. I think the AIM differences will be minimal as well. Intel Atom won't appear in cell phones until 2010, late 2009 maybe. It'll be called something else too as it would be a different product line from Intel Atom. Proton or something. Considering that Apple said it would have 3G phones during the iPhone announcement at MWSF2007, over a year ago, yes, it is 100%. I doubt one can opt out of the iPhone G2 data plan. Much more important is the cost of a 3G data plan. If $20 like the EDGE, great. If $40, not so great. The cost of the data plan is absolutely key for the iPhone. I put this at 25%. It's very possible they will live with WiFi, cell tower triangluation in G2. It'll certainly be fine for walking. And in NYC, may actually work better than GPS as the tall buildings ain't great for GPS signals. But GPS? I'm beginning to think no. If it is a problem, I think they'd rather collaborate with Garmin on a Bluetooth add-on before adding it in for the G3. 4) Slide-up Keyboard: As much as I want it I have to be realistic. This is pretty close to never. This was a grand decision for Apple early on. And they choose the right path I think. As for what you don't have listed, I'm sure there will be an Apple unique thing. Like ubiquitus WiFi sharing or something. My friend from the UK has a phone that does videochat. Why can't iPhone do that? Videochat over iChat would be nice too, since it would be free over WiFi. They probably don't want to piss off AT&T by cutting them out of the loop on that though. Also it should have a better camera and record video. Those are consumer priorities based on my anecdotal observations from riding the bus to work and walking around the city. An FM tuner would be nice too. I can wish, right? In the vein of wishful thinking, I'd also add that it could record music to MP3 and MP4 and have a TV tuner and recorder. In fact if they had a Swiss Army Knife addition, I'd be all set. 5: the ability to hide apps on the home screen : why cant I hide Youtube? 6: WIFI syncing: My iphone and macbook both have 802.11b/G and BT 2.0, so why then must I use a cable to sync? 7: FLASH! facts are facts, flash drives the web, we need flsh on the iphone -- that one is being worked on apparently. 9: the ability to shoot and email quick videos: this would he huge! that said, I like my iphone, and am not looking back. Voice Dialing...VOICE DIALING! WE NEED VOICE DIALING!